Japanese motorcycle giant Yamaha created a robot that is learning how to copy a motorsports champion. At the Tokyo Motor Show on Wednesday, the company revealed Motobot, its autonomous motorcycle-riding humanoid robot, which can to ride an unmodified motorcycle. 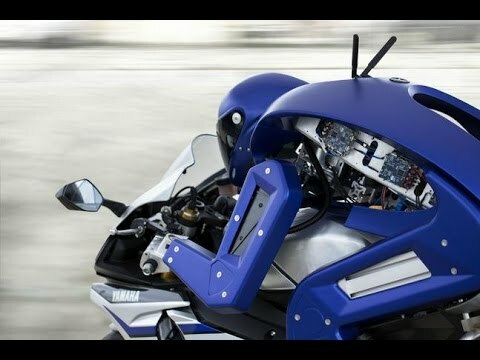 Yamaha wants Motobot to ride faster than 200 km/h (124 mph) on a racetrack, but the company did not disclose the robot's top speed when announcing its new creation. Mashable has reached out to Yamaha for clarification. "The task of controlling the complex motions of a motorcycle at high speeds requires a variety of control systems that must function with a high degree of accuracy," Yamaha said in a statement. Motobot is also part of Yamaha's research efforts toward better rider safety, it said. In the promotional video above, the robot issues a challenge to Italian world champion Valentino Rossi. As a childhood picture of Rossi comes on screen, the robot, using a digitized boy's voice, says: "I am improving my skills everyday, but I'm not sure if I can even beat the five-year-old you." Motobot makes it clear that it's gaining on Rossi ? and the rest of humankind: "I am not human but there has to be something only I am capable of. I am Motobot. I was created to surpass you."